Why Use Defined Contribution Software? 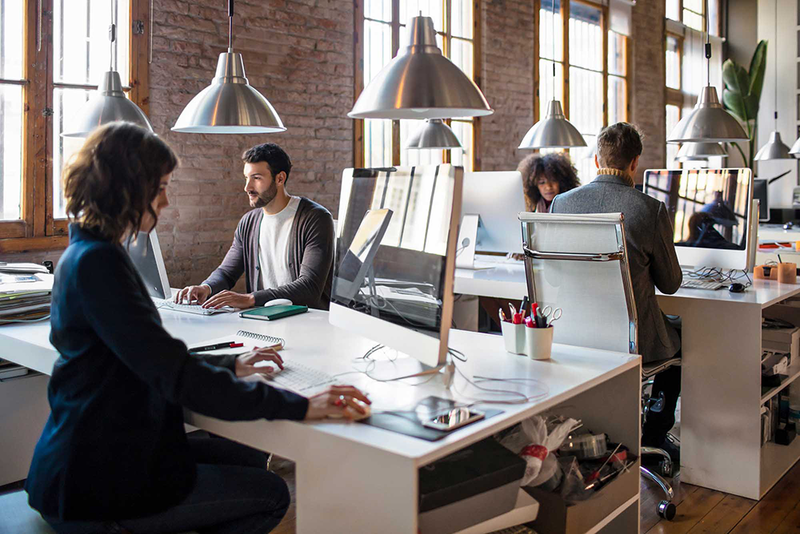 Defined contribution health plans are gaining popularity with small and medium-sized businesses as a new alternative to employer-sponsored group health insurance plans. Rather than paying the costs to provide a specific group health plan benefit (a "defined benefit"), employers can fix their costs on a monthly basis by establishing a defined contribution health plan. Defined contribution health plans by themselves are not health insurance plans. With defined contribution health plans, both the employees and employers save on the cost of health insurance. A defined contribution health plan is set up using a Healthcare Reimbursement Plan (HRP). 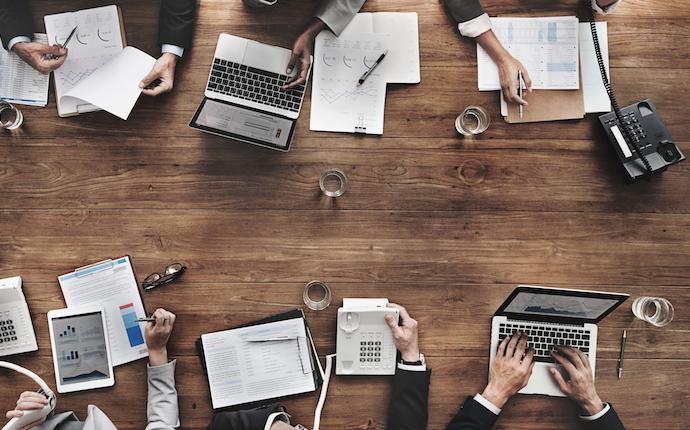 There are two main reasons why businesses should use Defined Contribution Software to administer their defined contribution plan: 1) Time savings/ease of use, and 2) Tax-savings/compliance. Administer a defined contribution health plan online in less than 5 minutes per month. Integrate a defined contribution health plan with existing payroll or HR processes. Manage the defined contribution health plan online 24/7. a) Tax Savings & IRS Compliance: The IRS requires that a formal defined contribution health plan (with IRS-compliant plan documents) be established in order for reimbursements to be tax-free for the employer, and employees. HIPAA (Medical Privacy): By using Defined Contribution Software, your software provider processes employees’ claims, keeping all medical information is HIPAA-protected. And, all receipts are stored in compliance with HIPAA for 10 years, as required by the IRS for audit purposes. The employer never sees employees’ medical information. ERISA: Under ERISA, the employer is not allowed to “endorse” a specific individual health insurance plan. 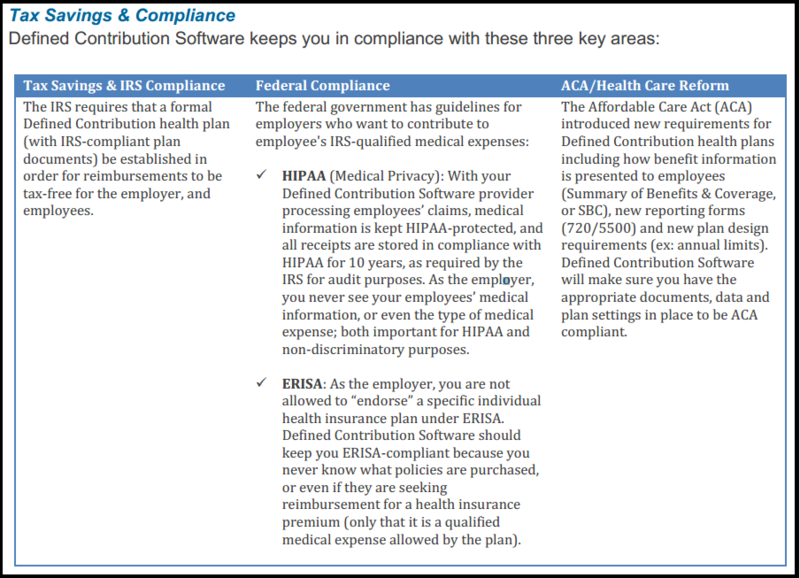 Defined Contribution Software keeps the employer ERISA-compliant because you never know what policies are purchased. c) ACA/Health Care Reform: The Affordable Care Act (ACA) introduced new requirements for Defined Contribution health plans including how benefit information is presented to employees (Summary of Benefits & Coverage, or SBC), new reporting forms (720/5500), and new plan design requirements (ex: prohibition on annual limits). 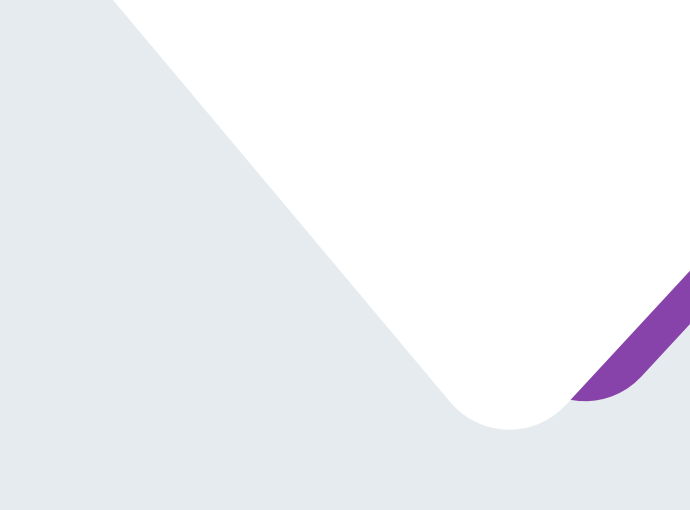 A good Defined Contribution Software provider makes sure you have the appropriate documents, data and plan settings in place to be ACA compliant. FAQ: Can I Administer the Defined Contribution Health Plan Myself? Technically, a company can self-administer its own defined contribution health plan, but failure to comply with the minimum federal administration requirements is common (and costly) without utilizing proper Defined Contribution Software. If an employer does utilize proper Defined Contribution Software to fully comply with the HRA, ERISA, HIPAA, COBRA and ACA regulations, the administrative cost likely outweighs the benefits. FAQ: Can I Pay For Employees’ Insurance Premiums Without an Formal Defined Contribution Plan? Some businesses might want to pay directly for an employee's individual health insurance plan without utilizing an ERISA and HIPAA-compliant platform, but doing so may put the business out of compliance with federal regulations and may increase the company’s (and employee's) tax liability.